Published: Jan. 22, 2014 at 02:50 p.m. Updated: Jan. 23, 2014 at 09:50 a.m.
Mike Pettine is a little closer to knowing his fate with the Cleveland Browns. "I should have some feedback on my interview by the end of the day," the Buffalo Bills defensive coordinator told The Plain Dealer on Wednesday. Those words come after Pettine spent four hours talking with Cleveland's brass Tuesday night in Mobile, Ala., at the Reese's Senior Bowl. According to NFL Media Insider Ian Rapoport, the feedback Pettine received is that he is a finalist for the position. A source informed of the Browns' plans said Pettine will fly to Cleveland on Thursday for a third interview. 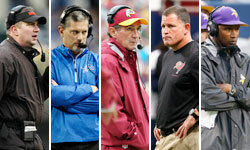 The Browns also interviewed former Tampa Bay Buccaneers coach Greg Schiano on Wednesday, Rapoport reported, per a source with knowledge of Schiano's schedule. Rapoport added that Schiano will not be hired, citing a source with knowledge of the Browns' thinking. Rapoport reported that Atlanta Falcons offensive coordinator Dirk Koetter spoke with the team Wednesday, characterizing the meeting as more of a conversation than a formal interview, according to a source familiar with the organization's thinking. And Rapoport reported that the Browns spoke with New England Patriots offensive coordinator (and former Denver Broncos coach) Josh McDaniels earlier this week, per a team source, but McDaniels is not considered to be in the final mix.